Happy Tuesday! I trust your shares are holding up in this tricky market and that you continue to find my Blog useful. I’ve been in this full-time investment lark for six months now — and I am pleased to say that I have still not lost everything just yet! Indeed, my portfolio has witnessed further gains of late — so much so that I reckon I am now beating the market so far this year. Nonetheless, I continue to hold a few standstill shares that I would love to see move higher! What did Buffett say about lethargy and sloths? I mentioned in my Q1 update that I’d decided to publish a Blog post after every quarter to round-up what’s been happening within my portfolio. So here is the recap of my April/May/June activity — or lack of it! I explained why I sold my shares in Pennant International, Burford Capital and SeaEnergy in my Q1 review. Well, if the Greece situation deteriorates further, then maybe that great buying opportunity will finally arise! As it is, though, I’ve purchased only one share during the last three months — a top-up of Record (REC). I felt the latest results from the currency specialist were encouraging, not least the 10% dividend lift, while the shares appeared attractively priced given the firm’s apparent recovery. I outlined why I bought more REC shares in this Blog post. The lack of trading may not appear exciting, but I have learnt over time that ‘exciting’ within the stock market does not usually translate into ‘profitable’. Instead, I prefer to take the dull route to potential riches, not least by “making fewer and perhaps better investment decisions”. That was the advice I took from The Loser’s Game many years ago — and it transformed my investing. Although my portfolio has been mostly inactive since April, I have kept tabs on all of my existing holdings — trying to seek out bargain buys just in case. 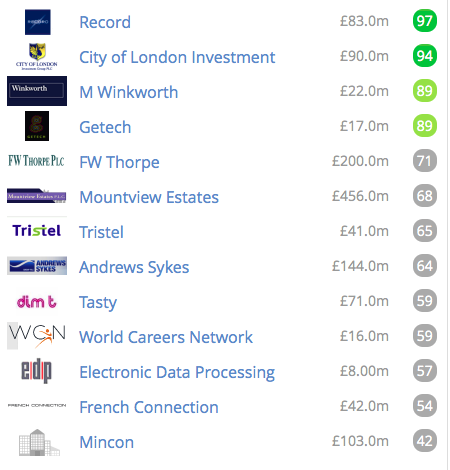 No news from City of London Investment, FW Thorpe, Getech and Tasty. I must admit to being a tad nervous about French Connection and Getech. The former has already warned on profits this year and I have to confess I have written privately to the fashion chain’s chairman, Stephen Marks, to encourage changes to the board. To cut a long letter short, I suggested to Mr Marks that he: i) step down to become a non-executive, and; ii) appoint a new and incentivised chief executive to transform the business into a pure licensing and wholesale business. Mr Marks has apparently “made note” of my “forthright views”. I hope that bodes well for the next trading update. Meanwhile, Getech remains heavily exposed to the oil and gas sector and I wonder if it is only a matter of time before a profit alert is issued. However, the group’s latest results were surprisingly resilient and the share price does seem to be pricing in some disappointment already. Should I be selling? Only time will tell. I said back in April that I had struggled to find decent companies trading at reasonable valuations. That’s not really changed — as my trawling for suitable watch-list names has drawn only one extra candidate. As with most ‘obviously good companies’ at present, Bioventix has a share price to match its attractive qualities. But you never know — the business could one day hit a rough patch and the current valuation may subside. Elsewhere, I couldn’t find enough to tempt me to buy BP Marsh, Cenkos, Dewhurst, Numis and Zytronic despite what appeared to be some lowly share prices. You could say they all looked cheap for a reason, although I would not rule out revisiting some of those shares in the future if things were to change. Dewhurst and Zytronic in particular were borderline decisions to reject for my watch list. I am a subscriber to Stockopedia and have noted the positive progress of the website’s StockRank facility. 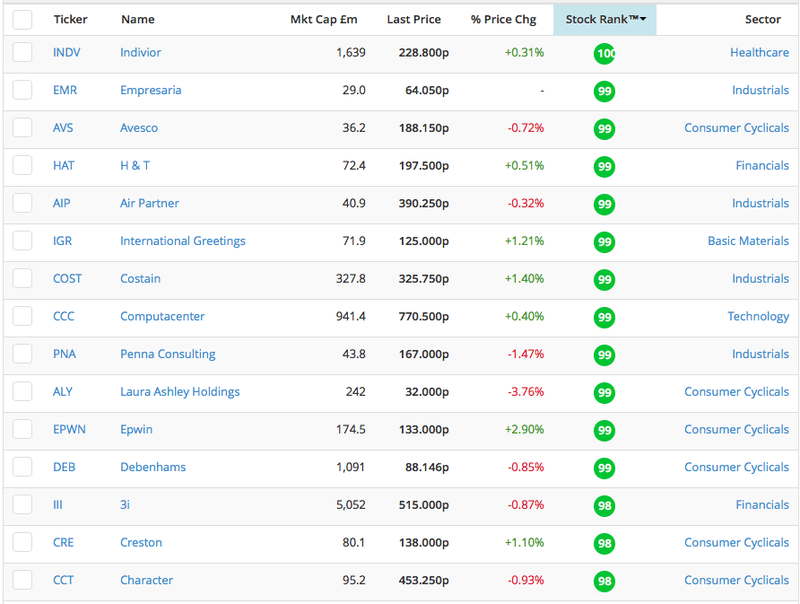 I won’t bore you with the full details, but Stockopedia analyses every share on various Quality, Value and Momentum factors, and calculates what it calls a StockRank. Basically, the higher the StockRank, the greater the investment potential (in theory). It will be fascinating to discover whether those in the green do indeed perform better than the rest. Let’s see if my portfolio can outperform that lot! This entry was posted in My Portfolio on June 30, 2015 by Maynard Paton. 1) I think a quarterly review like this is a good opportunity to reaffirm goals, overall strategies and other big picture factors. I think it’s easy for active investors to get lost in the details of stock picking, so a portfolio review is a good chance to step back and look at the forest instead of the trees. 2) I like your heavy application of sloth-like behaviour. A few well thought through decisions are better than lots of poorly thought through ones. 3) The whole StockRank thing is interesting. I do something similar myself and I would completely agree that higher quality and value (I don’t look at momentum) stocks will tend to outperform, although “tend” is a pretty loose term. It might take quite a few stocks before you have good evidence that your higher StockRank stocks are outperforming on merit rather than luck (assuming they do outperform over the next few years). Thanks for the comment. My portfolio is still a bit of a mishmash weighting wise, which is due to a few winners doing very well, and a few positions that I started but the price then gained or the company then hit trouble, so I held off buying more and was left with a smaller holding. I sometimes look at my portfolio and think the best buying opportunities are not always the most dominant positions, but I have generally been doing alright over time. 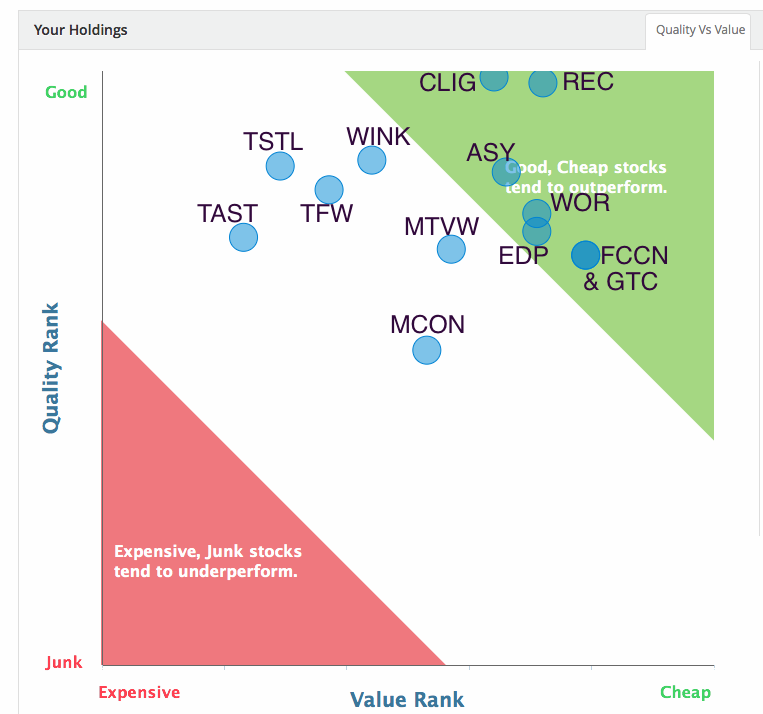 With the StockRanks, I thought it useful to show the Bubble chart (a relatively new feature on Stockopedia). 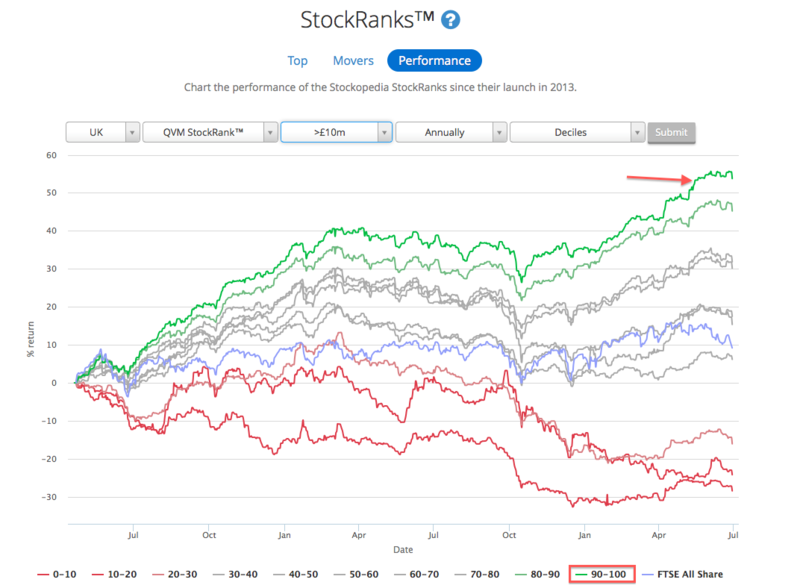 I must admit I am not sure whether the whole StockRank theory can work long term, but it is an interesting concept and I do wonder whether those 15 top SRs can outperform me, the market and everything else over time. I ignore momentum, too! Hope your UKValueInvestor portfolio continues to do well. Enjoying the posts and always interesting to see other portfolios. There’s a lot of overlap in what we’re looking at, it seems! Thanks Lewis. I do read your blog — though I must admit with HRG I just see pension deficits as generally something to go wrong for shareholders :-) Keep up the good work.